Your credit score: a current snapshot of how much money you owe and how good you are about paying off your debts. These days you can’t buy a car or home, open a credit card or even get car insurance without someone peeking at your credit history. Thanks to the three major credit bureaus: Equifax, Experian and Trans Union, lenders can easily see if you’re creditworthy. The bureaus give lenders three little numbers that are the sum total of every credit card, loan and late payment that you’ve ever had. Those three numbers equal your credit, or FICO, score. FICO is the Fair Isaac Company, they create and compute your credit score. Your score will range between 300 and 850, and your goal should be a score of 750 or more. This will give you the best interest rates when shopping around for a loan or credit card. Credit history – Do you pay your bills on time? Outstanding debt – How much do you owe everyone and for how long? New credit applications – Every time you apply for a credit card or loan, it shows up and impacts (negatively) your overall credit score. Length of credit history – The longer your history, as long as it’s good, the better your score. Stability – Have you lived and/or worked at the same place for three years or more? Types of accounts – If you have a mix of credit like credit cards (revolving credit) and loans (installment credit) your score will be higher. The one thing you won’t find on your credit report is your actual FICO score, unless you pay a service for it specifically. Every bureau will have a different score for you, since they sometimes pull their data from different lenders. Fair Isaac has their own site with credit score services at myFICO.com. If you don’t want to pay for your credit score, you’re allowed one free credit report each year from each of the nationwide consumer credit reporting companies (Equifax, Experian and TransUnion). And believe it or not, the government has made it easy to get it. 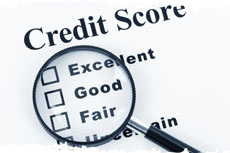 All you have to do is visit AnnualCreditReport.com or call 877-322-8228. Despite what you may see on television, this is the only place to get a truly free credit report. You can pick which bureau to get your report from or pay to have the others as well. Since some stores and companies report to certain bureaus but not others, your best bet is to get all three. When it comes to your credit, the more information, the better. You’ll find your name, address, Social Security number, current and previous employers and estimated income on your credit report. It also lists any loans you have, including student loans, car loans etc., as well as any credit cards you have or have had in the past. This list includes the amount you owe and your payment history, breaking it down into 30-day periods of late payments, if you have them. Once you get your credit reports from the bureaus, review them immediately, including your basic information like name and address. Make sure that every credit card or loan listed is something you’ve actually had and that the details are accurate. If you notice any mistakes, contact the individual bureau. Details on how to do it are usually listed at the end of the report. Help keep your credit report clean by reading Avoid Credit Card Debt.